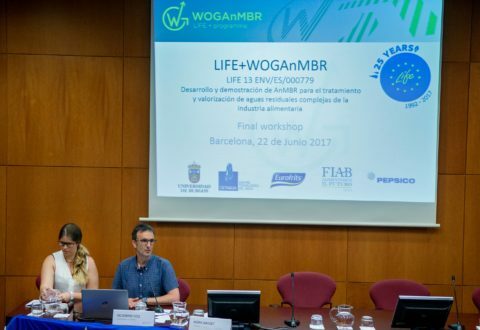 As a company engaged in the LIFE+WOGAnMBR project, within the EU LIFE program, Eurofrits participated in the conference “Anaerobic technologies applied to the food and beverages industrial sector”, celebrated last June 22nd in Barcelona. At this event Sergio López, our Maintenance Director, described the process of wastewater treatment in our factory located in Burgos, a sustainable process respectful with the environment. The conference, addressed to environmental professionals, academics and research centres interested in anaerobic digestion in the industry, revolved around the purification of water in the food and beverages industries. In this sense, the challenges ahead were laid out and discussed in the subject of wastewater treatment in these industries. 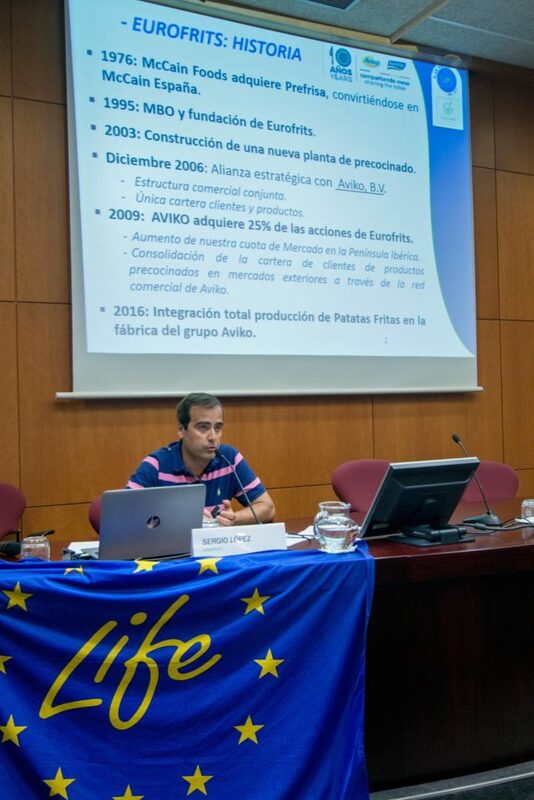 As a speaker from Eurofrits, Sergio López went through the process of wastewater treatment in our factory in Burgos and made a balance of Eurofrits participation in the LIFE+WOGAnMBR project, for which our plant in Burgos has used an innovative anaerobic membrane bioreactor (AnMBR). “The bioreactor behaved very satisfactorily in our plant. Given that the maintenance for the pilot plant was very small, it is perceived as an option for the future”, asserts Sergio López. Sergio López, Eurofrits Maintenance Director, at one point during his talk. 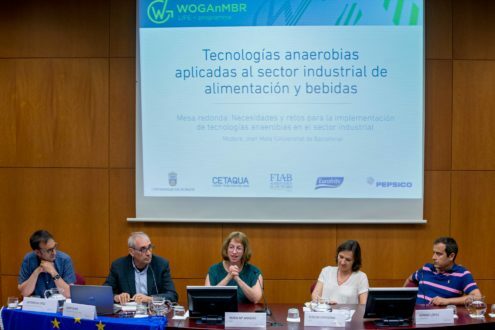 Aside from this, throughout the day the LIFE WOGAnMBR project, framed within the LIFE program of the EU, in which we participate along with the Burgos University, the Water Technology Centre (CETaqua), the Food and Beverage Industries Spanish Federation, and the food and beverage firm Pepsico. It is a project intended to prove the technical, economic and environmental viability of an innovative anaerobic membrane bioreactor (AnMBR) in order to achieve an efficient process that digests organic matters, produces biogas and filters water. The talks gave way to a round table that debated the needs and challenges of the anaerobic technology in the industrial sector, with representatives from different institutions. Victoriano Díez, from Burgos University, Joan Mata, from Universitat de Barcelona, Nuria María Arribas, of FIAB, Teresa Ortigosa from SUEZ and Sergio López, of Eurofrits, at the round table at the end of the conference. An intense and interesting day in which the environment and the initiatives to preserve it were the themes around which it all revolved. More info on the LIFE WOGAnMBR project, click HERE.